If you’re new to twitter, or still trying to work out how to get the most out of it, we’ve developed a twitter plan to help you get started. Click here to download and start using: My twitter plan. 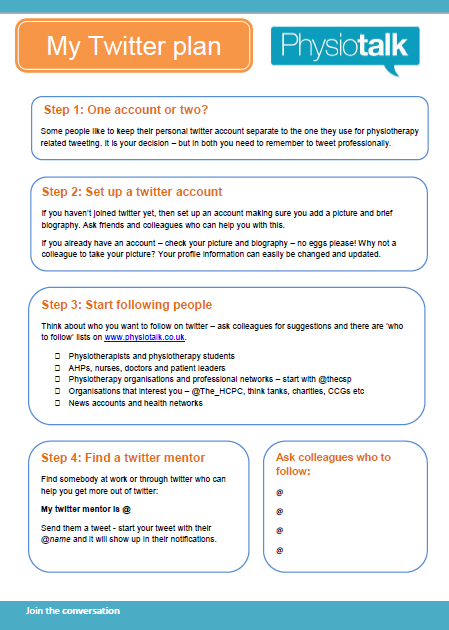 We’re always trying to improve the information provide on this website so let us know how we could add to or change ‘my twitter plan’ by commenting on this page or tweeting @physiotalk.